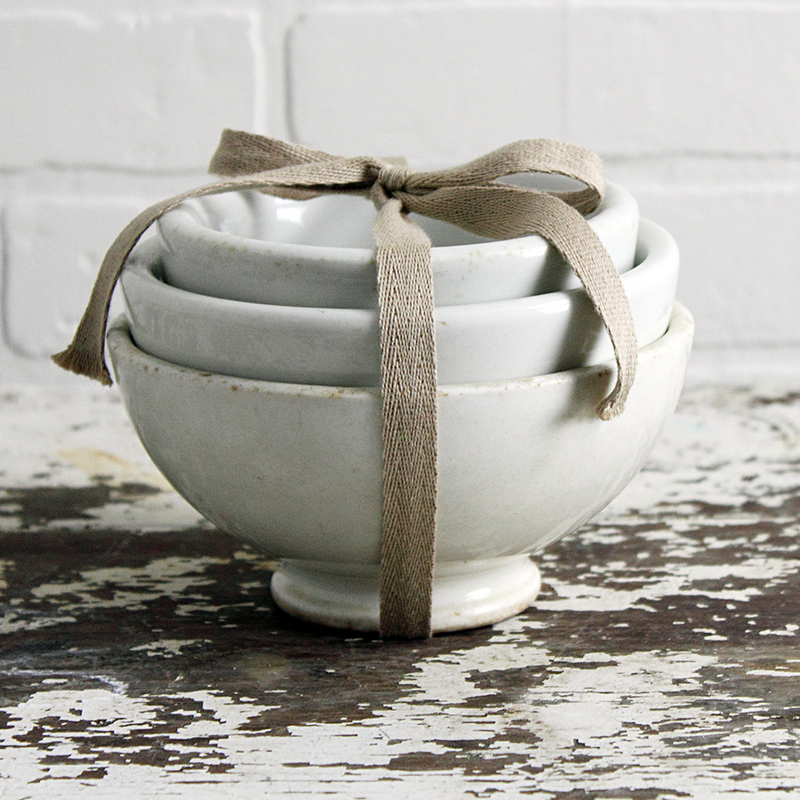 Three mismatched vintage heavy ironstone bowls. The smallest bowl measures 5" in diameter by 2 1/2" tall. It has a makers mark on the bottom that reads "Jaxon" which indicates it was made by the Jackson China company somewhere between 1914 - 1930s. The medium bowl measures 5 3/4" in diameter by 2 1/2" tall. There is no makers mark. The largest bowl measures 6" in diameter by 3" tall. This bowl is footed. There is no makers mark. The bowls have a nice heft to them. There are no chips or cracks on any of the bowls, but there are characteristic utensil marks and light staining from a lifetime of use. Please check out my Etsy shop for more great vintage finds. 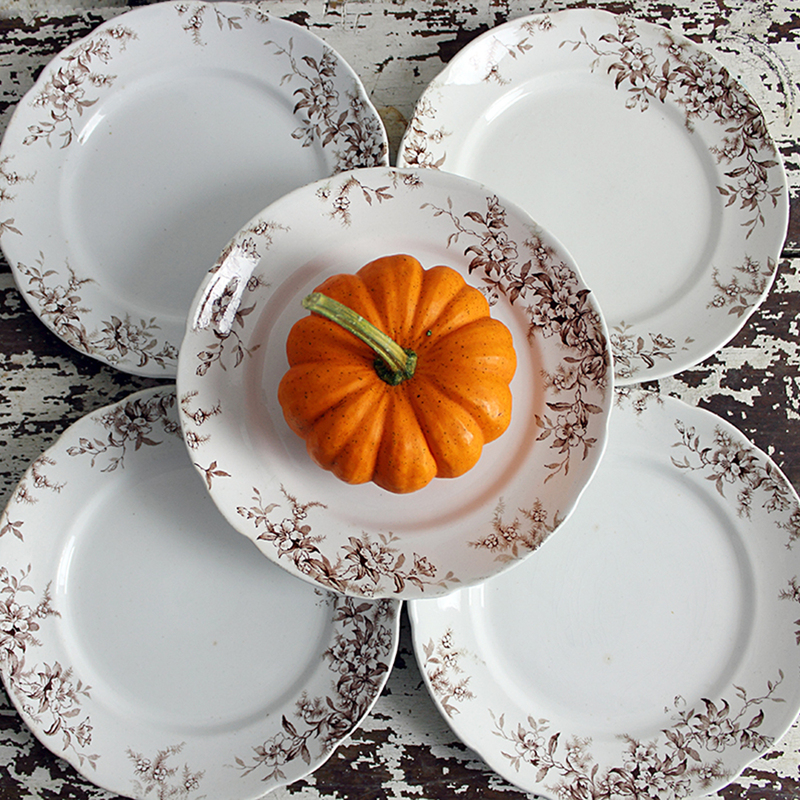 Lovely set of 5 antique brown English transferware plates. These were manufactured by J. H. Weatherby & Sons of Hanley, England. The pattern is called "Woodland" and the makers mark indicates they were made in the late 1800s. The makers mark reads as follows. They each measure 8" in diameter. The plates are in very good condition for the age. No cracks or crazing. One plate does have a shallow 3/16" chip under the rim, but it is barely noticeable. There are the characteristic utensil marks from use, as well as some glaze bubbles and under under-glaze peppering from the manufacturing process. 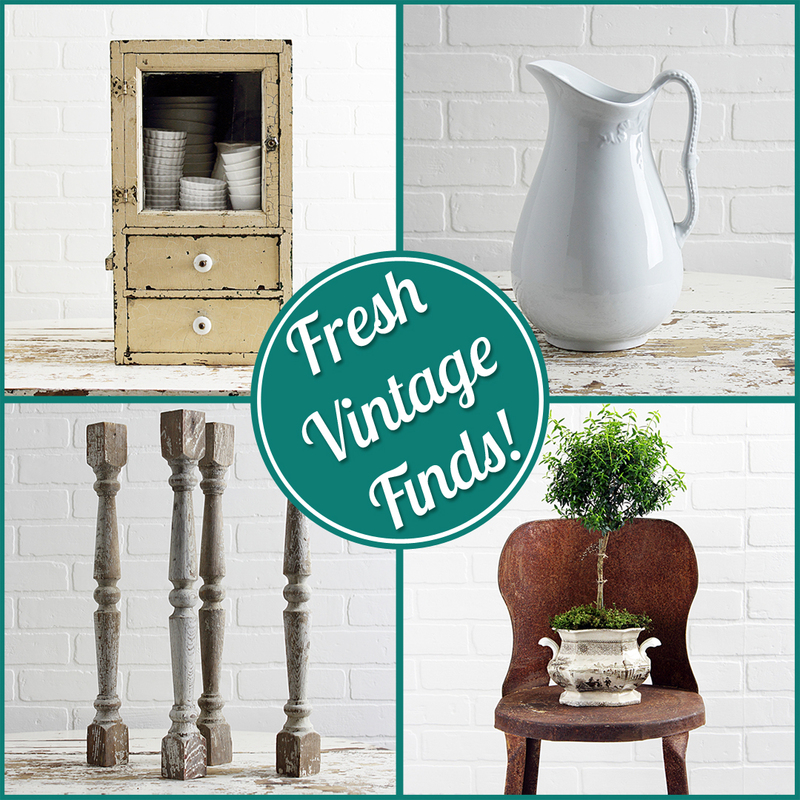 For more great vintage finds, visit my Etsy shop. 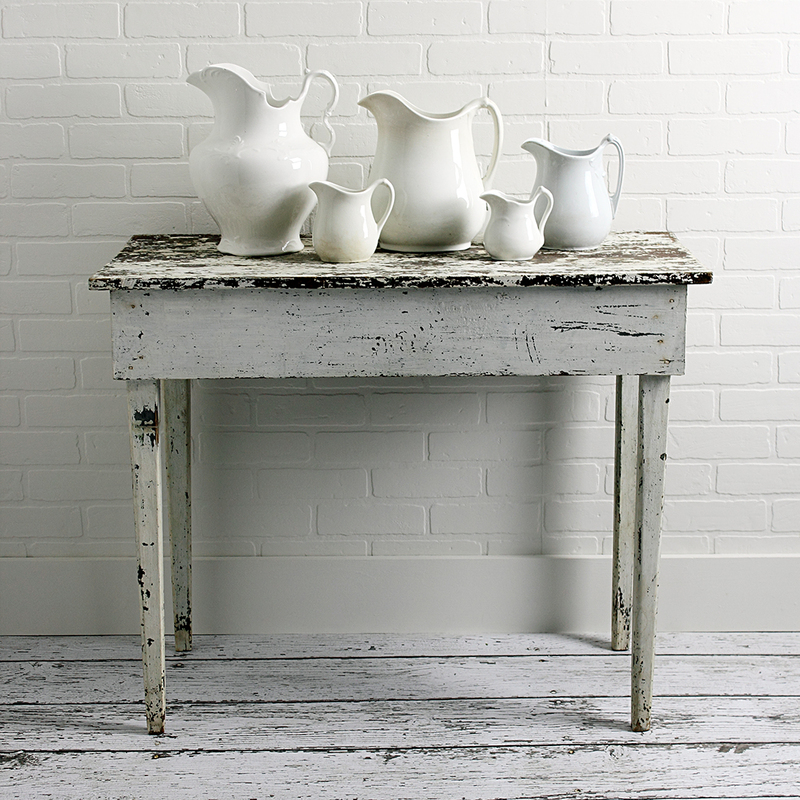 I love this vintage farmhouse table with it's chippy old white paint and weathered charm. It's the sort of piece you'd see in a country decorating magazine or a cottage style coffee table book. The table is very sturdy and is loaded with tons character from a lifetime of good use. Overall dimensions are 36 1/4" long by 17 1/2" wide by 28 7/8" tall. Vintage industrial metal kitchen stool. It has all over rust and a few dents and dings from a lifetime of use. 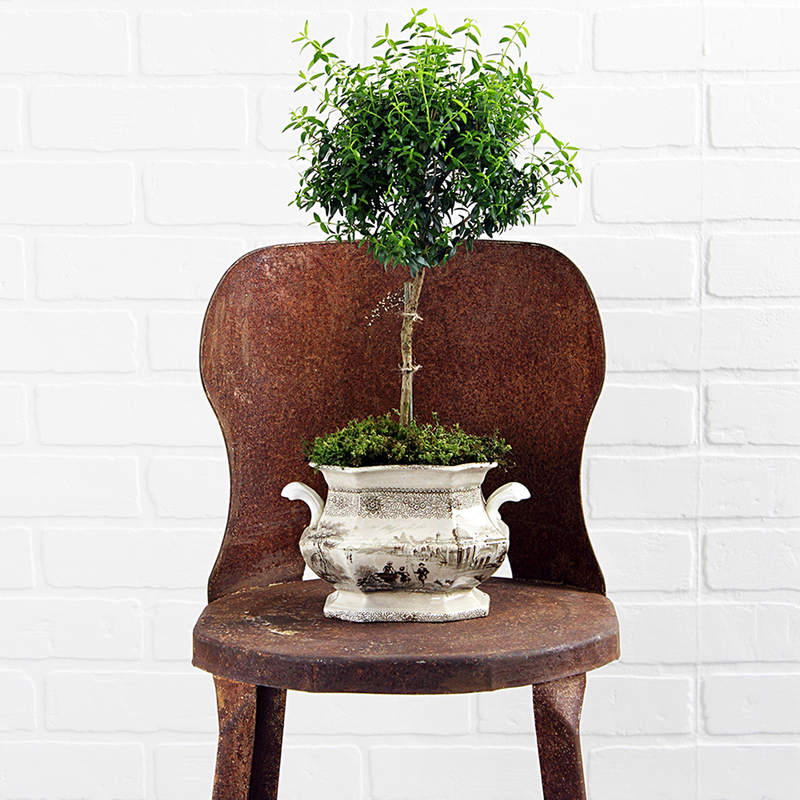 The perfect plant stand for your industrial loft, farmhouse porch, or cottage chic kitchen! 31 1/4" tall (to top of back) by 14 1/4" wide (at base) by 14" deep (at base). The seat height is 21" by 12 3/8" wide by 12 3/8" deep. Still has the original rubber on the feet. Antique wooden medical cabinet or first aid cabinet in old cracked cream colored paint with remnants of old green paint underneath. 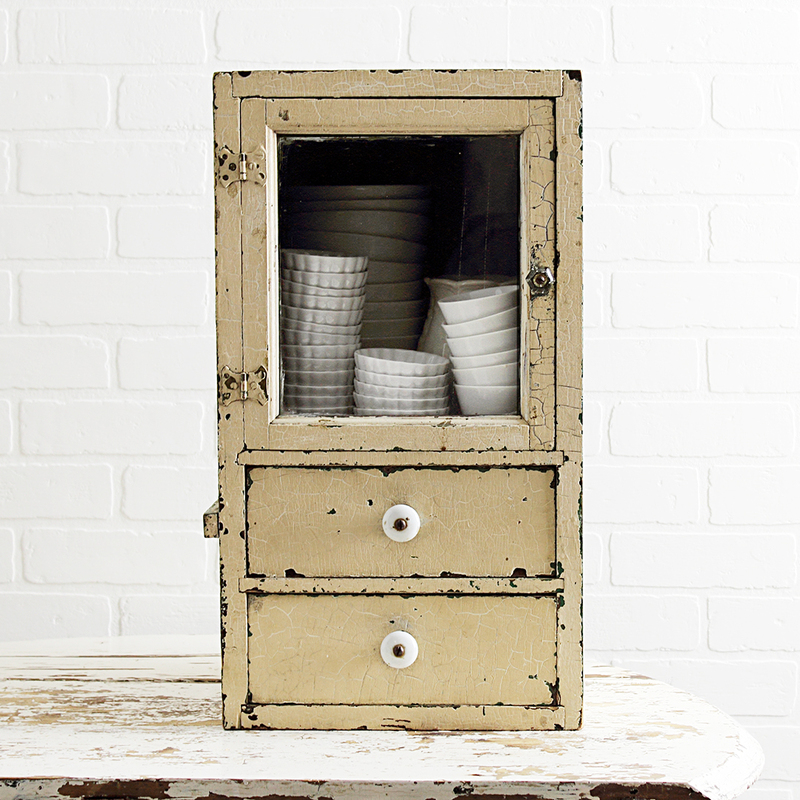 It features a glass door with a glass knob and two drawers with porcelain knobs. The cabinet is heavy and very sturdy. There is a strip of wood on one side which is held on with two screws. I believe there may have been another part to this cabinet and that this strip of wood was used to support a shelf that ran between both parts. It can easily be removed. This is such a wonderfully versatile piece. It would be lovely for displaying collections or used in a kitchen or bathroom as a functional piece. Overall dimensions are 22" tall by 12" wide by 12" deep. The inside of the cabinet measures 11 1/2" tall by 10 " wide by 10" deep (front to back). The inside of the drawers measure 3" tall by 9" wide by 10" deep (front to back). 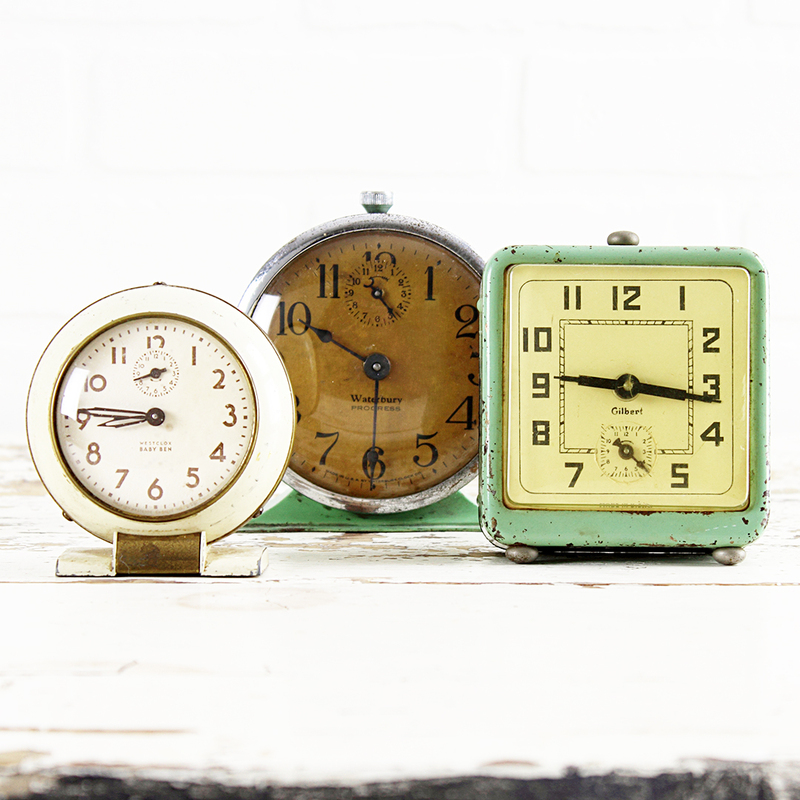 Trio of vintage alarm clocks. The two on the right are favorites of mine. Love the old paint! These are from my personal collection, but I do list some from time to time in my Etsy shop. Finally adding some fresh inventory to my Etsy shop. 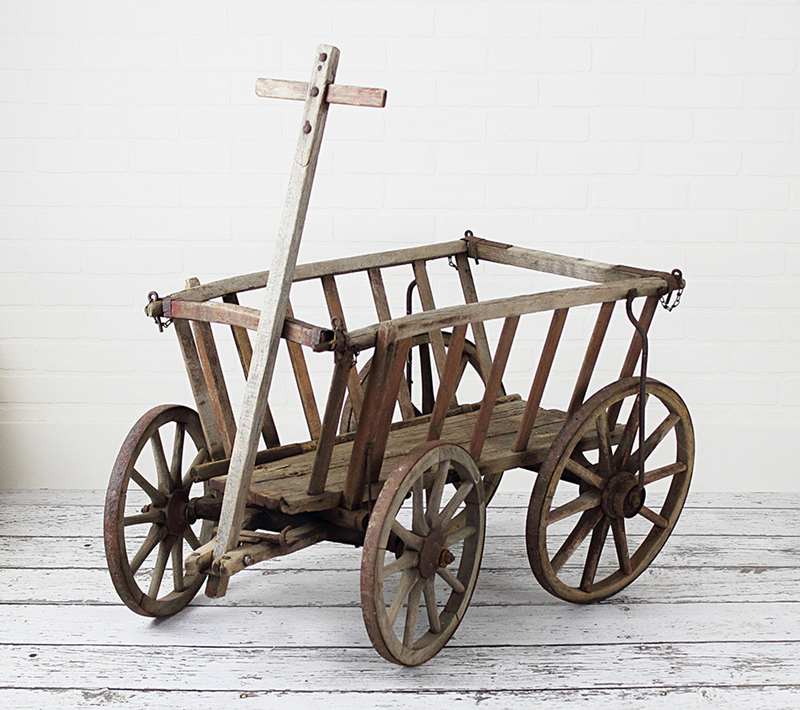 Antique European goat cart - potato wagon or hay wagon, c. early 1900s. Used on farms and in gardens throughout Europe during the early 20th century. These handmade carts were used primarily for hay and to transport feed and produce to and from villages. They were multi-functional and are known by different names. Some refer to them as goat carts while others call them potato wagons or hay wagons. These days they are used primarily for decorative purposes. They are lovely when filled with gourds and pumpkins in a fall display or with potted spring flowering plants spilling over the edge on a front porch or in a garden. This cart is in great condition for the age. The hand-hewn wood is weathered and the metal components are rusty. There is one small chunk of wood missing and an early repair ( see the fourth photo). This is characteristic of something of this age that was heavily used and it only adds to the charm of the piece. All and all this primitive piece of farm equipment has been well care for over the years. The cart is approximately 39" long by 24" wide by 22" tall. The pull handle is 31" long. The front wheels are 14" in diameter. The back wheels are 16" in diameter. PLEASE NOTE: For shipping purposes I may need to remove the the pull handle. It's held on with a single nut and bolt and will be very simple to reattach when it arrives. The assembly is fairly self-explanatory. 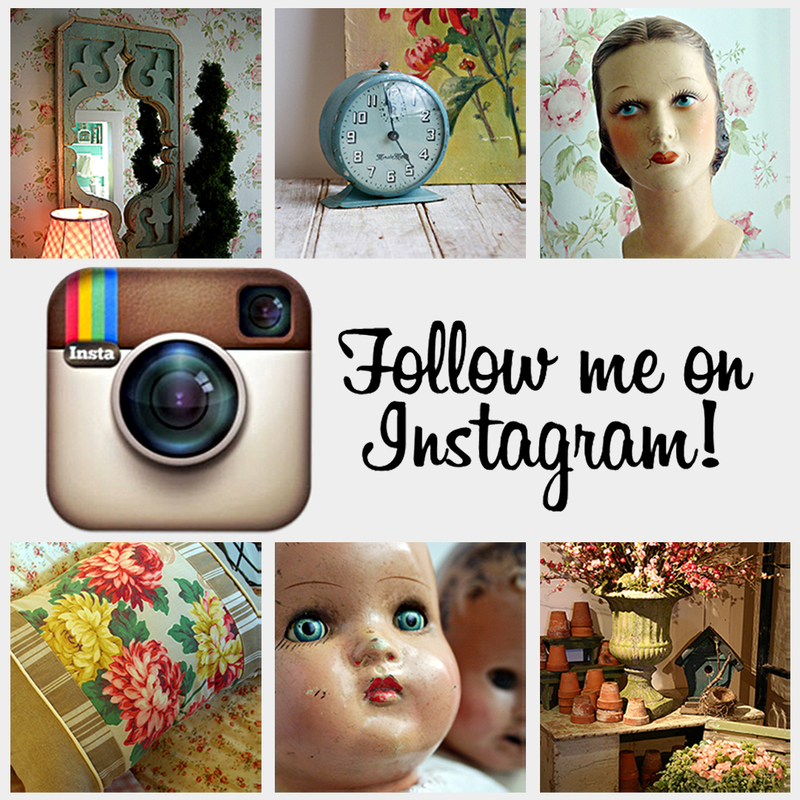 Find more unusual antique and vintage wares in my Etsy shop by clicking the following link.